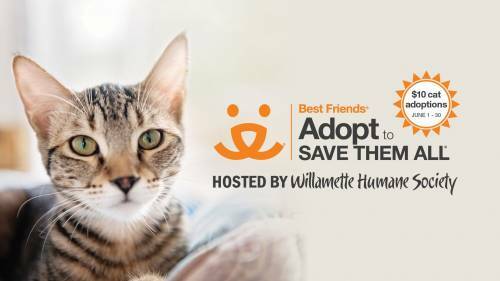 Meet your new best friend at Willamette Humane Society this summer! In the month of June, adopt a senior (ages seven years and up) and special needs cat for $10—an adoption special in partnership with Best Friends Animal Society. This special adoption rate is only available from June 1-30, 2017. Please note that our regular adoption application and screening process still applies. Questions? Please visit the WHS Adoptions Team in Davenport’s Den any time the shelter is open or call us at 503-585-5900.